St. Universiteti, p.n. 70000 Ferizaj, Republic of Kosovo. from the Agricultural University of Tirana, Faculty of Forestry Sciences where he continued to master and in 2004 received the title of Doctor of Science. While master (MBA) for the second time over the University of Staffordshire, England. In 2003 he was elected Lecturer at the University of Prishtina, Faculty of Applied Technical Sciences in Ferizaj, in the years 2004-2007 he held the office of the coordinator of the ECTS and coordinator of Academic Development at the same university. During 2005 and 2006 he has been Head of the Department woodworking. In 2006 he was elected Assistant Professor and in 2011 was appointed Associate Professor. Mr. Bajraktari was elected Dean of the Faculty of Applied Technical Sciences in Ferizaj at the University of Pristina in 2006 to be re-elected for his second term in 2009. During 2008 to 2012 served in the Government of Kosovo as Political Counselor in the field of forestry. 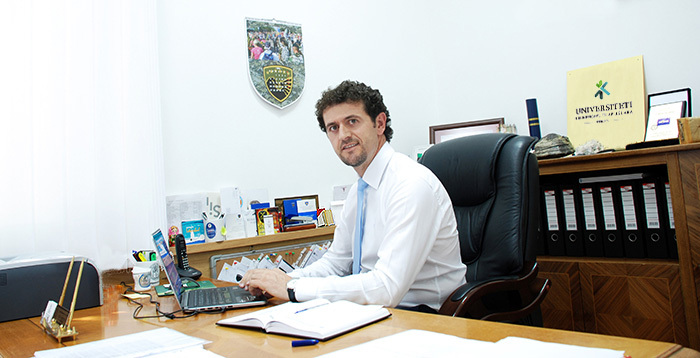 From 2012 to 2014 was Vice-Rector of the University of Pristina. Since 2013 a member of the Board of the University of Mitrovica. He has over 90 presentations at various international conferences (America, Argentina, Brazil, China, Japan, South Korea, Russia, and various European countries), also published his work in magazines recognized international peer review and impact factor. It reviewer 6 international journals and a member of the most important organizations in the world in the field of forestry and wood industry, and in many cases has been on the scientific committees and events in the field of drying wood which is specialization Mr Bajraktari closely. He has published three books of his field of study (2 monographs and 1 university book). Mr. Bajraktari has been leading various projects over the years of his leadership of the faculty and during his work at the Government of Kosovo. He speaks English, German and Italian. Fatime is his wife and has 2 children, Dren and Ensarën.